There seems no end of applications for 3D printing – ranging from house building to medicine, it’s certainly shaping into a seriously flexible technology. Now, scientists have developed a 3D printed heart which they hope will eventually help some of the 26 million people worldwide suffering from a variety of cardiac conditions. There is a shortage of donor hearts and as such, there is a real demand for a functional artificial heart. A team from ETH Zurich in Switzerland has just developed a 3D printed heart made from soft silicon which can beat just like a human heart. The team was made up from scientists from the Functional Materials Laboratory who collaborated with members of the Product Development Group Zurich in order to come up with their design. The intention was to design a product which mimicked nature as cloesly as possible. The reason for this is that the blood pumps which are used at the moment have a wide variety of mechanical parts which are susceptible to damage. The artificial heart was created using a lost-wax technique in order to make a cast. This method is also sometimes called investment or precision casting and is more commonly used to create a duplicate sculpture from an original. The 3D printed heart weighs 390 grams and has a volume of 679 square centimetres, making it roughly the same size as a real heart. It also has ventricles as you would expect, although rather than being separated by a septum, the researchers instead used an additional chamber. This chamber is necessary to provide the inflation and deflation of the heart, by means of pressurized air. This is necessary in order to pump blood from the chambers, as opposed to the muscle contractions of a real human heart. The performance of the artificial heart has been thoroughly tested, with the results published in the journal Artificial Organs, titled ‘A soft total artificial heart – first concept evaluation on a hybrid mock circulation.’ Whilst the initial results are certainly promising – demonstrating that the artificial heart works in much the same way as the real deal, the downside is that this functionality currently only lasts for 3,000 beats. This equates to around 45 minutes in real life. But as explained by Cohrs: “This was simply a feasibility test. 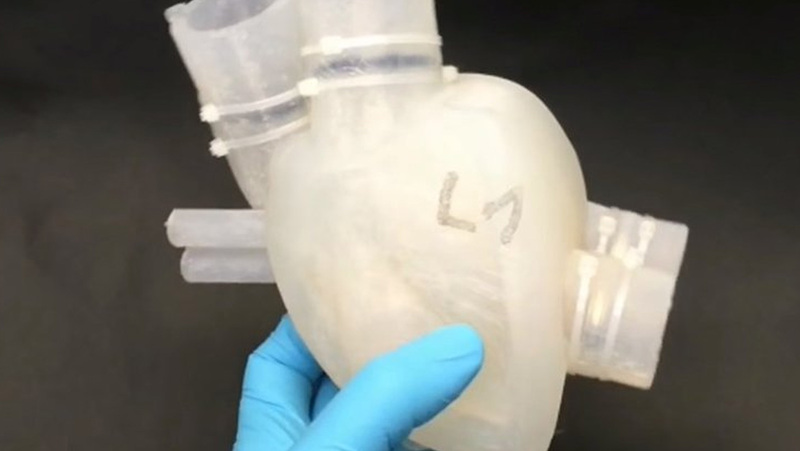 Our goal was not to present a heart ready for implantation, but to think about a new direction for the development of artificial hearts.” The next stage for the researchers is now to look at increasing the lifetime of the heart, as well as increasing blood flow and aortic pressure. This is certainly a step in the right direction to providing a potential solution, and lifeline, for those people on the waiting list for a donor heart.